DIYer Palle Olsen picked up some cheap super glue and mounting tape to mount his PS3 and its four annoying cables to the wall. Put a little super glue on the tape and start adding your cables. You'll need to hold the cable in place each time as the superglue dries. Palle found the superglue was necessary as the cables wouldn't stick without it. This is a bit of work, but it makes for a really unique wall decoration. I've done a much less ambitious design and turned my cables into a tree. 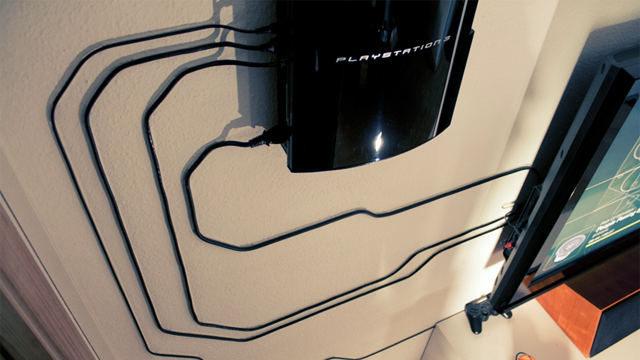 If you've been creative with your exposed cables, let us know what you did—with pictures!—in the comments. Not a bad idea, I usually just bunch them all together and throw them behind the cabinet. Dear god I am very concerned for that PS3. BUT HOW AND WHY DID HE STICK HIS PS3 TO THE WALL?! Looks cool, but he will regret this once the super glue weres off..if that's even possible lol. What happens if you want to move the ps3? I imagine the glue would pull paint off the wall and/or leave a mark. Cool idea though, mine are cable tied and hidden behind the cabinet/computer tower. I need to do something like this (but without being an idiot by putting the PS3 on the wall. Seriously, who does that?!! ). If my husband even looks at cables they tie themselves in knots. And we have two drawers full of "spare" cables that just seem to be propagating. I'm scared that one day I'll wake up with cables around my neck. HA HA! This make stoo much sense to me! Thank you for using the word propogate, I have had that word on the tip of my tongue for about a week. Now I can use it. cool until your ps3 phat dies like everyone else. What people here don't seem to realise, is that he is not gluing the cables to the wall, he is gluing the cables to the tape... the tape which is stuck to the wall. Less paint-peeling action when you want to move/remove it. Why does he need that many cables?? I have 1 Power, 1 HDMI and that's it? It looks neat, but I really couldn't be arsed. So long as my cables are out of the way I'm happy.